BRICS: Should Russia be worried about a Brazilian ‘Brexit’? The chances that a change of guard in Brazil would put integration projects under the auspices of BRICS on hold and cool the relationship between the South American giant and Russia are pretty high – but not a given. The new interim government of Brazil’s acting president Michel Temer has the potential to become, in theory, a detrimental factor for the integration trend within the BRICS (Brazil, Russia, India, China, South Africa) grouping and a disturbing element in the special relationship Brazil has painstakingly built with Russia over the past years. Conspiracy theory addicts in Moscow would love to detect traces of a U.S. plot in the ousting of Brazilian President Dilma Rousseff. They would most certainly find inspiration to back their point in the military cliques and pro-American dictators that ruled Brazil for more than 20 years, from 1964 to 1985. Plot-lovers would claim that the actual aim of removing Rousseff from high office was to undermine BRICS, since Russia and China are formally listed as national security threats to the United States. Whether the affair is the result of an elaborate plot or not does not really matter. Was Michel Temer in his early days an “informant” for the U.S. Embassy or not, as claimed by Wikileaks, is also irrelevant. The conservative credentials of the 75-year old lawyer and his track record in politics are proof enough that the amendment of foreign policy is imminent. The crucial question is to what length such amendments might go. 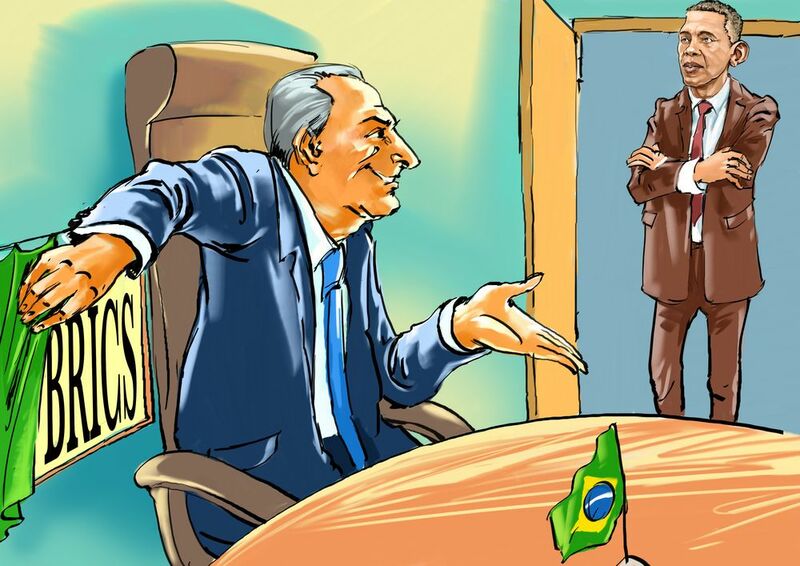 The question is – could these developments lead to Brazil quitting the BRICS grouping? Most probably this will not be an acceptable option. Such a drastic move would be viewed as a sign of subservience to the geopolitical agenda of a third party. Moreover, it is a risky move in the comprehensively divided nation that Michel Temer promises to unite. What is more certain is that a new pro-U.S. president would not participate in full in various projects that further BRICS’ integration drive. Most notably, the new president might backtrack on the BRICS New Development Bank, which – despite its modest $100 billion reserve fund (plus additional $100 billion) – represents a move toward a non-U.S. supervised alternative to the global financial architecture. Brazil might end up playing something akin to the role of Britain within the European Union. London is known to be more receptive to the interests of the United States and the Anglophone alliance as a whole and less cooperative with its continental neighbors. But this would be conditional on Brazil accepting the role of a U.S. confidant and pseudo-vassal, calling Washington’s tune. This is not a given. Left-leaning political elites have been hit hard by the disappearance from center stage of former president Lula da Silva and Rousseff. But any scrupulous observer of history’s spirals would agree that upheavals and downturns tend to repeat themselves. For the moment, it looks like the pendulum will stay on the conservative side for a while. If Temer succeeds in making Brazil hostage to more expensive loans from international financial institutions, rolls back the achievements of the left-leaning governments of Lula and Rousseff – who managed to lift around 30 percent of the population out of poverty – and balances the budget by cutting public spending on health and education, the social pendulum will inexorably swing in the opposite direction. So which of the three current mega-challenges for Brazil are the greatest threat to bilateral relations with Russia – the envisaged tilt to the West under acting president Temer, the stuttering economic performance of the world’s seventh-largest economy, or the still uncontrolled Zika virus? Well, regardless of the fears of conspiracy theorists, the first of these seems unlikely. Why? In spite of the personal convictions and special connections of President Temer, there is no reason to suspect he will abrasively act against the national interests of his country. Not putting all one’s eggs into one basket is one of the rationales of sound foreign policy. Secondly, Moscow, under the strain and stress of the psychological war with the West, has learned to maintain workable contacts even with adversaries and unfriendly partners. It can certainly establish an acceptable modus operandi with President Temer even if he chooses to alienate others and be alienated inside BRICS. Thirdly and finally, going against the tide, against an increasingly multi-polar world that is witnessing the emergence of non-Western – yet not anti-Western – alliances like BRICS, is counterproductive at the least. In my view, Brazil will neither quit nor freeze its membership in BRICS but instead readjust its activities, making them more low-key and non-threatening to the interests of the multinationals “led from behind” by U.S. business.